The International Space Station (ISS) serves as an orbital laboratory and supports a permanent crew of up to six personnel. On-orbit construction started in 1998, with continuous human presence beginning in 2000 with the arrival of the first ISS crew. The first ISS crew consisted of ISS commander William Shepherd, Soyuz commander Yuri Gidzenko, and flight engineer Sergei Krikalev. 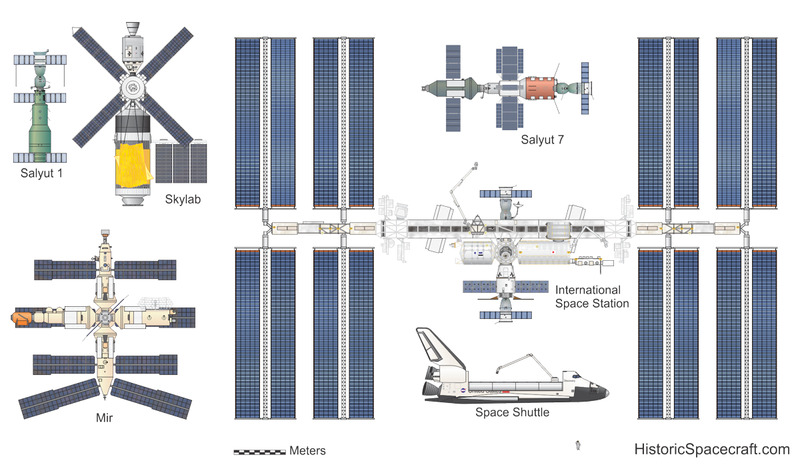 The station includes more then a dozen pressurized modules, including the Russian Zvezda service module, the American Destiny laboratory, the European Columbus module, and the Japanese Kibo laboratory. A large truss, measuring over 90 meters in length, provides mounting points for solar arrays, radiators, and other components. Four large solar arrays generate around 100 kilowatts of usable power. 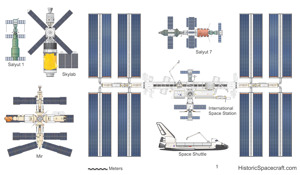 A Mobile Servicing System, or MSS, aids with construction, resupply, and maintenance of the space station. The MSS consists of three main components. The Space Station Remote Manipulator System (SSRMS), known as Canadarm 2, is a robotic arm measuring over 17 meters in length. The Mobile Base System (MBS) is a work platform that can move along the truss. The Special Purpose Dexterous Manipulator (SPDM), known as Dextre, includes two manipulator arms, tool holders and lights. The station operates in an orbit inclined 51.6 degrees to the equator. 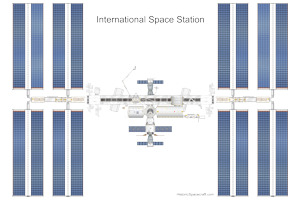 The Space Station is supplied by an international fleet of spacecraft. These spacecraft provide a variety of services, including crew transport, pressurized cargo resupply, space station re-boost, cargo return, and refueling capabilities. 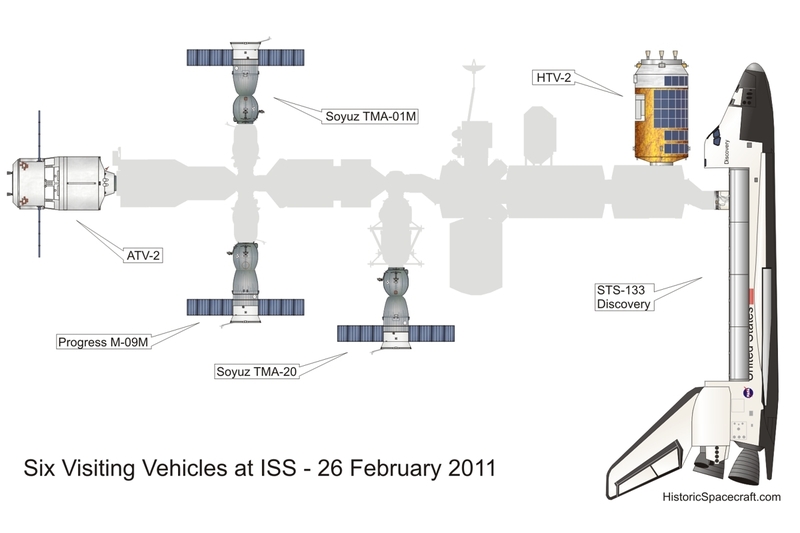 With the arrival of STS-133 on February 26, 2011, a record six vehicles were at the station simultaneously (illustration below). In addition to Space Shuttle Discovery, three Russian spacecraft included Soyuz TMA-01M, Soyuz TMA-20 and Progress M-09M were docked to the station. A Japanese H-II Transfer Vehicle (HTV-2), and a European Automated Transfer Vehicle (ATV-2), were also at the station. 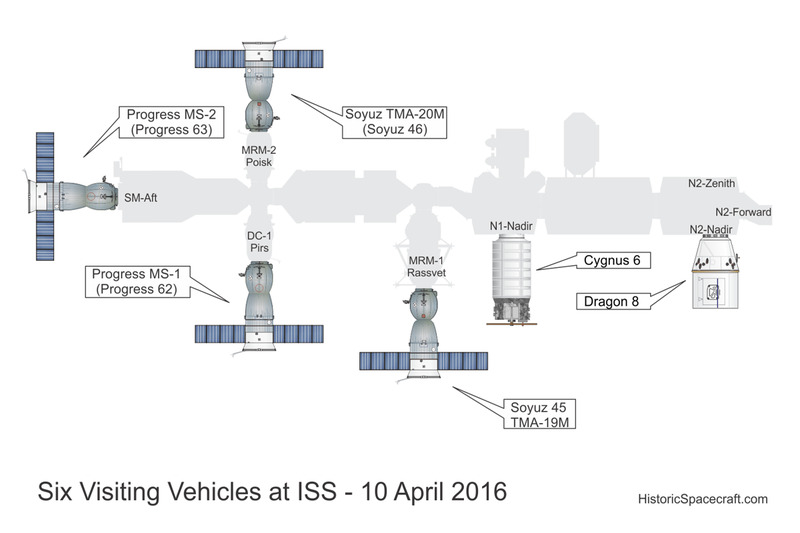 Visiting Vehicles at the ISS on 10 April 2016. Visiting Vehicles at the ISS on 26 February 2011. 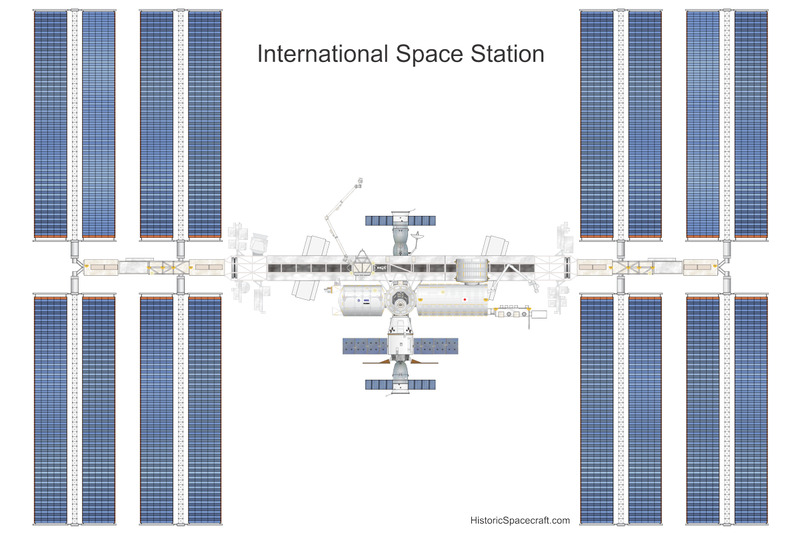 Size comparison of ISS and other space stations. The Zarya module, sometimes known as the Functional Cargo Block (FGB), was the first ISS module to be launched. Paid for by the United States, Zarya was built by Russia. The module provided power, attitude control, and other systems for the station during early years of construction. The module continues to provide storage space for space station supplies. Node 1, also known as Unity, was the first American built pressurized module added to the station. The module has six Common Berthing Mechanisms (CBM). Each CBM provides a mounting point for other modules. Node 1 can be fitted with up to four standard payload racks. Pressurized Mating Adaptors (PMA) are used as interfaces between Common Berthing Mechanisms and spacecraft docking equipment. The ISS currently includes three PMAs. PMA-1, attached to the aft CBM of Node 1, connects to the forward docking port of the Zarya module. The PMA provides a pressurized tunnel between American and Russian built space station sections. PMA-3 is used as an alternate docking location for American Space Shuttles. The PMA was originally attached to the nadir, or Earth facing, CBM of Node 1. Similar to the Mir base block, Zvezda provides living quarters, waste management equipment, life support systems, communications and control equipment. The module has four docking ports. Zvezda includes a propulsion system consisting of 32 attitude control engines and two orbital maneuvering engines. The Z-1 Truss houses communications, electrical distribution, and attitude control equipment. Z-1 is permanently attached to the Zenith berthing port on Node 1. Communication equipment includes components for both S-band and Ku-band systems. Four control movement gyroscopes (CMG) provide attitude control for the station. The Z-1 truss served as a temporary attachment point for the P-6 truss. Solar arrays mounted on the P-6 truss provided power during the early years of space station construction. P-6 was later moved to its permanent position on the main truss as assembly progressed. Located between Node 1 and Node 2, the US Lab can be considered the "core" of the American section. The module is designed to hold 24 standard size modular racks. These racks can be changed out in orbit and can be used for different purposes, including life support equipment, robotics control stations, crew quarters, waste management, storage, and various scientific experiments designed to be installed in orbit. New payload racks can be delivered in an MPLM, or the Japanese HTV spacecraft. A high quality window, 50.9 cm (20 inch) in diameter, is located in the side of the module. This window can be used for photography and other Earth resource experiments. Canadarm2, also known as the Space Station Remote Manipulator System (SSMRS) is a 17.6 m robotic arm used to assemble and service the International Space Station. The arm has seven degrees of freedom and features Latching End Effectors (LEEs) at each end. The LEEs can attach to payload grapple fixtures or to Power Data Grapple Fixtures (PDGFs) located at strategic points around the station. The PDGFs serve as mounting points for the arm and permit power and data connections to be made. The arm can reposition itself from one PDGF location to another using an inchworm-like movement. The Quest airlock supports Extravehicular Activity (EVA). Quest is composed of two cylindrical chambers. The larger chamber, known as the Equipment Lock, provides an area for storing and maintaining EVA equipment, and for conducting EVA preparations. The smaller chamber, known as the Crew Lock, can be depressurized to allow astronauts to exit the module. To reduce the amount of atmosphere lost during each EVA depressurization, a special pump is used to extract as much atmosphere as possible from the Crew Lock prior to venting the remaining atmosphere. Storage boxes, mounted on the exterior of the Crew Lock, provide storage space for EVA tools used during spacewalks. High-pressure atmospheric gas tanks are attached to the Equipment Lock exterior. These tanks can be swapped out with new tanks as needed. Progress M-SO1, launched on a Soyuz rocket on 14 September 2001, delivered the Pirs module to the ISS. Pirs will serve as an airlock for EVA's using Russian space suits. The Pirs module also provides a docking port for Soyuz or Progress spacecraft. The Mobile Base System (MBS) serves as a base for Canadarm2 and Dextre. The MBS is mounted on a mobile transporter that can move along a track mounted on the main truss. The Node 2 module includes six CBM ports and can be fitted with up to eight standard payload racks. The module is attached to the forward CBM of the Destiny laboratory module. Pressurized Mating Adaptor-2 (PMA-2), relocated from the forward CBM of the Destiny laboratory module, is attached to the forward CBM of Node 2 and serves as the primary docking port for American space shuttles. The Japanese Kibo laboratory connects to the port CBM, while the starboard CBM is occupied by the European Columbus laboratory module. As originally planned, the Centrifuge Accommodation Module was to have berthed at the zenith CBM. The Centrifuge Accommodation Module has been cancelled and will not be part of the finished ISS design. Node 2 was constructed by Thales Alenia Space in Italy. The Columbus Laboratory was designed and built by the European Space Agency. The module provides pressurized laboratory space and can accommodate up to ten standard payload racks. The module has four mounting points for external experiments. 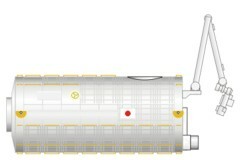 The Japanese Kibo laboratory consists of three main components, including the Kibo Pressurized Module, the Experiment Logistics Module - Pressurized Section, and the Exposed Facility. These components were launched on separate Space Shuttle missions. The Experiment Logistics Module provides storage space for the Kibo laboratory. The first module to be launched, the ELM-PS was temporarily berthed to node 2's zenith port. After the launch and berthing of the Kibo Pressurized Module, the ELM-PS was moved to its permanent location. 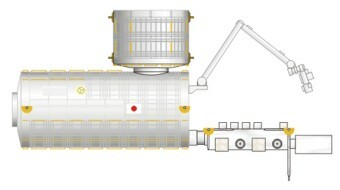 The Kibo pressurized module measures 4.4m in diameter, and 11.2m in length. The module includes two large windows, a robotic arm, and a scientific airlock. A common berthing adaptor, on the zenith surface, provides an attachment point for the ELM-PS. The Kibo Exposed Facility is an external platform that provides attachment points for various experiments and components. Kibo's robotic arm can be used to service these experiments. If necessary, individual components may be brought into the pressurized module using the airlock. Mini Research Module-2 (MRM-2), also known as Poisk, was delivered to the ISS using a modified Progress tug. 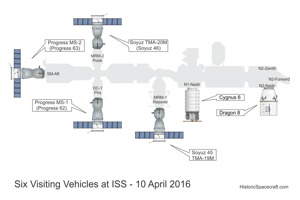 MRM-2 will provide a docking location for visiting Soyuz and Progress spacecraft. The module can also be used as an airlock and support spacewalks using Russian Orlan spacesuits. The Node 3 module includes six CBM ports and can be fitted with up to eight standard payload racks. The module is currently attached to the port berthing port on Node 1. Node 3 was designed and built by Thales Alenia Space in Italy. The Cupola allows panoramic views of space and provides a robotics control station for operating Canadarm 2 and Dextre. The Cupola features seven large windows. Each window has four panes, an inner pane to protect from scratches, two pressure pains, each 25mm thick, and an outer pane to protect from space debris. Each window pane can be replaced if needed. To reduce damage from micrometeoroids and orbital debris, the windows are covered with moveable shutters when not in use. The Cupola is currently attached to the Earth-facing berthing port on Node 3. The Russian built Mini Research Module-1 (MRM-1), provided the station with additional storage space, as well as additional clearance for Soyuz docking approaches. The MLM is berthed at the Nadir (Earth facing) port of the Zarya (FGB) module. MRM-1 was launched with Russian and American supplies loaded inside. Four trunnions, mounted two per side on outriggers, supported the module in the Shuttles payload bay during launch. Grapple fixtures on the module allowed the Shuttle's Canadarm Remote Manipulator System to remove it from the payload bay. The module was passed to the stations arm, Canadarm 2, for final installation. Several components, attached to the MRM-1 exterior, will be later installed on the Multi-purpose Laboratory Module (MLM). These items included a scientific airlock, a radiator, a work platform, and a spare elbow joint for the European Robotic Arm (ERA). 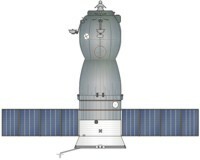 The MLM, scheduled for launch on a Proton rocket in late 2011, will dock at the Nadir port of the Zvezda service module. The Permanent Multipurpose Module was created by modifying a Multi-Purpose Logistics Module (MPLM). MPLMs were originally constructed to transfer pressurized cargo to and from the space station. Designed to be transported in the space shuttle cargo bay, these modules were only designed for several weeks in space. The MPLM "Leonardo" was transformed into the PLM. Modifications included increased micrometeoroid shielding, and internal changes to increase accessibility of equipment for maintenance in orbit. The PMM is berthed to the nadir port of Node 1. 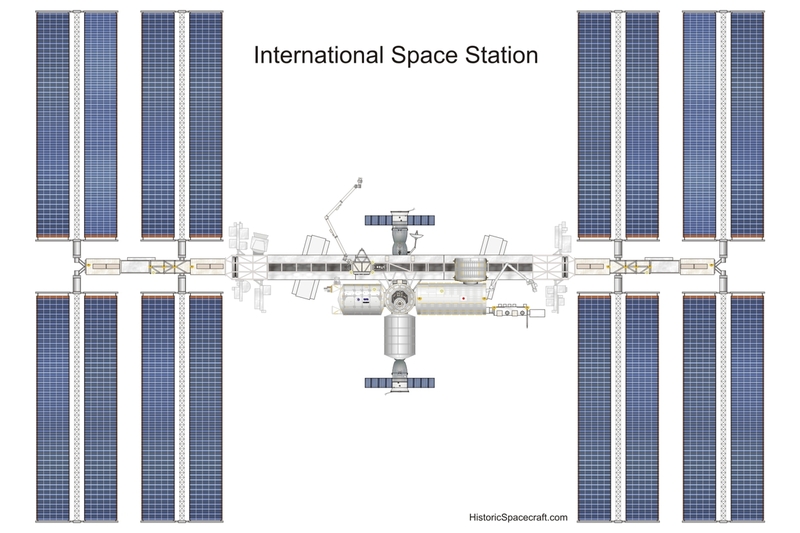 The Space Station is supplied by an international fleet of spacecraft. 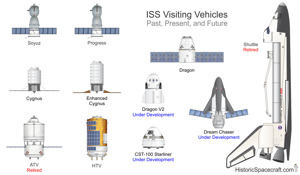 Sometimes referred to as "visiting vehicles", these spacecraft provide a variety of services , including crew transport, pressurized cargo resupply, space station reboost, cargo return, and refueling capabilities. Originally part of the Soviet Moon landing program, Soyuz has evolved into one of the world's most reliable crew transport spacecraft. The value of Soyuz goes far beyond simply carrying crew to and from space. Soyuz, capable of spending six months docked to a station, can serve as a lifeboat, allowing a space station to be evacuated at any time if conditions require it. Progress supply ships, based on Soyuz technology, can supply orbiting stations with fuel, water, food, spare parts, and other critical items. Without Soyuz and Progress, continuous crewing of orbital outposts would not be possible. 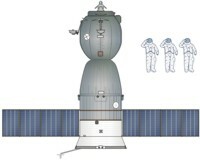 The Soyuz spacecraft is comprised of three main modules. The orbital module provides living and working space while on orbit. Docking equipment and rendezvous antennas, mounted on the top of the module, allows docking with orbiting space stations. The descent module contains the crew launch and entry couches, spacecraft controls and parachutes. A heat-shield protects the module during re-entry. The spacecraft has several retro rockets, designed to fire moments before touchdown, to help reduce landing impact forces. The descent module is 2.2 meters in diameter and is the only component of the Soyuz spacecraft to return to Earth. The service module contains the spacecrafts main engines, attitude control system, and parts of the life support system. Radiators and antennas are mounted on the exterior. Solar panels, included on most Soyuz models, are mounted on the service module. Introduced in the mid-1980's, Soyuz-TM would become the primary crew transport vehicle for the Mir space station. Later missions would fly to the International Space Station. Soyuz-TM replaced the Igla rendezvous system, used on previous Soyuz and Progress spacecraft, with the more capable Kurs system. With an ability to remain docked to a space station for six months, the Soyuz-TM was ideal for supporting long duration missions. Soyuz-TM 1, an unmanned test flight, occurred in May 1986. The first manned mission, Soyuz-TM-2, was launched to the Mir space station in February 1987. The last mission, Soyuz-TM 34, was launched in April 2002. Very similar to the Soyuz TM, the TMA model incorporates several changes to better accommodate NASA astronauts. The first Soyuz-TMA was launched to the International Space Station in October 2002. Set to retire in 2011, the American space shuttle has been the primary launch vehicle for ISS construction. 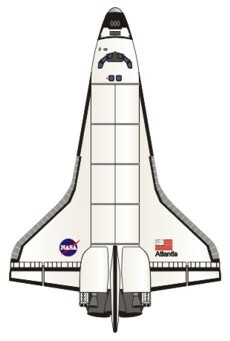 In addition to its large cargo capacity, the shuttle was able to support space walks during early construction missions. The Multi-Purpose Logistics Module (MPLM) was developed to transport supplies to the ISS. Built by the Italian Space Agency, the MPLMs were designed to carry up to 16 ISS payload racks. 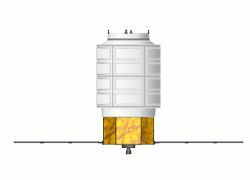 The MPLM could be carried to orbit in the Space Shuttle payload bay. Once the shuttle docked with the ISS, the MPLM would be removed from the payload bay and temporally berthed at one of the large CBM units. Once unloaded, astronauts could fill the module with components for return to Earth. Experimental results, equipment needing repair, and trash could be returned this way. After the hatch is closed, the MPLM would be un-berthed from the station, and returned to the Shuttles payload bay. After returning to Earth, the MPLM would be unloaded, cleaned, and refurbished for use on another mission. Three MPLMs were constructed by the Italian Space Agency. Limited duration space stations, such as Skylab and several of the early Salyut stations, were launched with all the supplies needed for their planned missions. Stations designed for longer occupation often can not be launched with all supplies on board. Things such as food, water, fuel, spare parts and other items are needed to maintain the station. While crewed spacecraft, such as Soyuz, can carry a limited amount of cargo in addition to crew, it is not nearly enough to support ongoing operations. The Soviets developed Progress, based on flight proven Soyuz-Ferry technology, as an unmanned supply ship. Not needing to include a crew, several major changes could be made. The descent module was removed completely. In its place was a newly developed tanker module. Fuel stored in tanks, within the tanker module, could be transferred to the space stations fuel tanks. This was accomplished via special propellant line connections incorporated into the docking equipment. The orbital module was re-configured to allow transport of pressurized cargo. After docking, space station crew members could open the hatch and unload cargo from the orbital module. While attached to a station, engines on the Progress could be used to adjust the orbit of the entire complex. At the end of their mission, Progress spacecraft would be filled with trash, undocked from the station, and de-orbited over remote areas of the Pacific Ocean. Early Progress spacecraft, based on the Soyuz Ferry, were battery powered and included the Igla automatic rendezvous and docking system. Progress 1, launched in January 1978, delivered food and supplies to the Salyut 6 space station. While docked, fuel transfers were successfully made between the Progress tanker module and the stations fuel tanks. Between 1978 and 1990, over forty Progress freighters were launched. Missions were flown to the Salyut 6, Salyut 7, and Mir space stations. Progress-M, first flown in 1989, included several significant upgrades. The addition of solar panels extended the time Progress could operate independently. The Igla rendezvous system was replaced with the newer Kurs system. A small return capsule is included on some flights. Carried in the orbital module, the return capsule could be deployed after the Progress undocks from the station. Progress M flew dozens of successful missions to the Mir space station and the International Space Station. Improved versions continue to service the ISS. Designed and operated by the European Space Agency (ESA), the ATV can deliver supplies and fuel to the ISS. The transport measures approximately 10 meters in length and 4.5 meters in diameter. Four deployable solar arrays generate electrical power. Each ATV is launched on an Ariane 5 rocket from Kourou, French Guiana. The first ATV was launched in 2008. Using an automated system, ATV transports dock to the aft docking port of the Russian Zvezda service module. Once docked, station personnel can unload supplies from the ATV's pressurized compartment. The transport carries a large amount of maneuvering fuel. While docked, the ATV uses its thrusters to re-boost the entire ISS as needed. The ATV carries extra fuel that can be transferred to fuel tanks on the ISS as needed. ATV can spend several months docked to the station. Near the end of its mission, the ATV, filled with trash, undocks, maneuvers away from the station, and de-orbits over unpopulated areas of the Pacific Ocean. The H-II Transfer Vehicle (HTV) was developed by the Japan Aerospace Exploration Agency (JAXA). Each HTV is launched on an H-IIB rocket. The first HTV mission occurred in 2009. The HTV measures approximately 10 meters by 4.4 meters and can transport a payload of around 6 tons, including both internal and external cargo. Internal cargo is housed in a pressurized volume designed to hold up to eight International Standard Payload Racks (ISPRs). An unpressurized section allows external cargo to be transported. A removable pallet, supporting external cargo, can be extracted from the side of the HTV using Canadarm 2. The pallet can be temporally attached to the ISS, allowing external cargo to be unloaded as needed. HTV spacecraft don't directly dock with the space station, as is done with Shuttle, Soyuz, Progress, and ATV, instead, the HTV will approach the station and station keep within reach of Canadarm 2. Astronauts on the station use the arm to grapple the HTV and manually move it to a berthing location. Depending on operational requirements, the transport will be berthed to either the nadir (earth-facing) or zenith port on the Node-2 (Harmony) module. Because the HTV attaches to a berthing port, rather than the smaller docking ports, larger payloads can be transferred to the station. The HTV can spend several months at the ISS. Its mission complete, the vehicle, filled with trash, maneuvers away from the ISS and de-orbits over unpopulated areas. Developed by SpaceX in partnership with NASA's Commercial Orbital Transportation Services (COTS) program, the Dragon capsule is capable of carrying both pressurized and unpressurized cargo to the International Space Station. At the end of each mission, the spacecraft can return pressurized cargo back to Earth. With the successful completion in May 2012 of the COTS 2+ demo flight, SpaceX was ready to start regular resupply flights to the International Space Station. Two or three Commercial Resupply Services (CRS) missions will be flown by SpaceX each year. 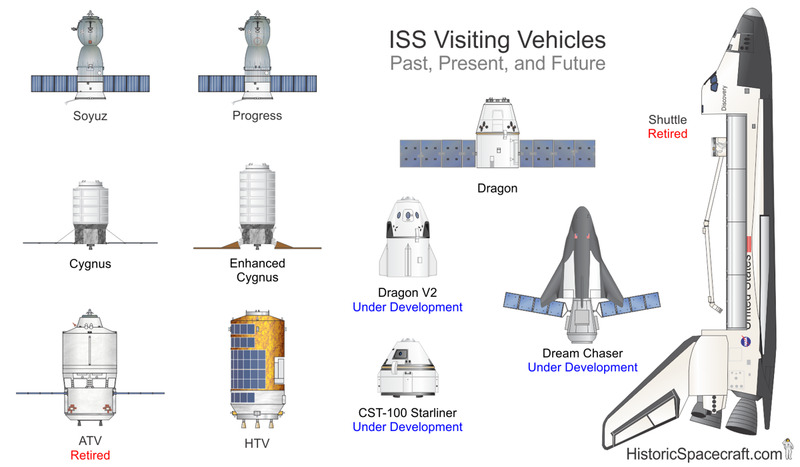 Each mission will use a Dragon capsule launched on a Falcon 9 rocket. The first flight of the Dragon capsule, launched on a Falcon 9 rocket in December 2010, became the first privately developed spacecraft to return safely to Earth from orbit. In May 2012, the second Dragon flight became the first commercial vehicle to berth with the International Space Station. SpaceX developed both the Falcon 9 rocket and the Dragon spacecraft. They are working toward developing rapidly reusable versions of each. A crewed version of the Dragon, capable of transporting up to seven astronauts, is in development. The Falcon Heavy rocket, also in development, will have over twice the lifting power of the largest rockets currently in use. (1) CRS-7 capsule destroyed by launch vehicle failure. NOTE: CCAFS SLC-40 = Cape Canaveral Air Force Station, Space Launch Complex 40. For more information about Dragon and Falcon 9, visit the SpaceX website. Developed by Orbital Sciences Corporation, in partnership with NASA, Cygnus was designed to ferry pressurized cargo to the International Space Station. Known as CRS, or commercial resupply missions, these flights are scheduled to occur around twice per year. At the end of each mission, the spacecraft performs a destructive re-entry into the atmosphere. Developed by Orbital Sciences Corporation, the Antares rocket is designed to launch over 5,000 kg into low Earth orbit. The rockets maiden flight, occurring in April 2013, was successful. The rocket was launched from the Mid-Atlantic Regional Spaceport, located near NASA's Wallops Flight Facility in Virginia. (1) CRS ORB-3 spacecraft destroyed by launch vehicle failure. NOTE: MARS = Mid-Atlantic Regional Spaceport. CCAFS SLC-41 = Cape Canaveral Air Force Station, Space Launch Complex 41. For more information about Cygnus and Antares, visit the Orbital website.